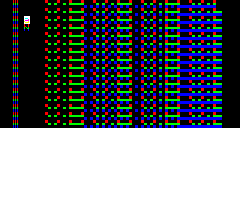 about 15 to 20 lines (more means charset colision) of 40*2=80 8 color pixels... not counting the video-inversion bit every 2 pixel. Using text mode means less data to handle (= higher frame rate). Never got the idea to use alternate charset for that. It looks like you found a variant of what I did for my STNICCC 2000 demo. It was my first practical use of the method after I discussed it on the newsgroup comp.sys.oric. idealy I should have the 75% but we do not have enough usable characters due to the fact that we can redefine only 4 characters every 5 since the 5th is overwritten by HIRES attributes changes. There are a bit more stuff in this article. Yes I saw that demo, but I thought it was all done in hires. One problem with alt charset is it's smaller. The resulting virtual resolution is smaller too. On the good side it's further away in memory, so we can use more lines before coliding with it. About the 75% issue, well I'm not sure the human eye is linear anyway, maybe it's better to have a log scale. It could be used to do fast effect even on text screens, like 8-step transtions between charsets.